The gray obelisk monument at Pointe du Hoc, a location often described as the most dangerous in the European campaign of World War II, was recently destined to collapse into the English Channel. It took what American Battle Monuments Commission Secretary Max Cleland called the best of both worlds – “American money and French ingenuity” – to strengthen the earth around the cliff-side memorial, which pays tribute to the U.S. Army Rangers who sustained 70 percent casualties to take out German positions on the coast between Omaha and Utah Beaches on June 6, 1944. 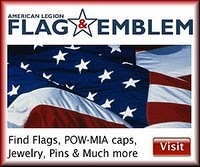 The site was rededicated Monday, on the 67th anniversary of D-Day. 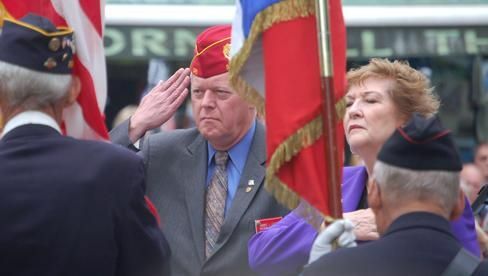 American Legion National Commander Jimmie L. Foster and American Legion Auxiliary President Carlene Ashworth joined dignitaries from around the world to unveil the rebuilt memorial site on the northwest coast of France. Former U.S. Rep. Chet Edwards of Texas was credited for having raised awareness in Congress and pressing for funds to restore the monument. He and his family were at Pointe du Hoc for the ceremony. Commander Foster and President Ashworth later joined leaders from several nations, including U.S. Sen. John Kerry, D-Mass., for French national commemorative activities at Utah Beach. Foster and Ashworth also laid wreaths at the Normandy American Cemetery overlooking Omaha Beach.